Vientiane (VNA) – Hanoi’s young people began a series of voluntary activities as part of the “Green Summer” campaign in the Lao capital city of Vientiane on August 18. During the week-long campaign, they will offer free health check-ups and medicines to 1,500 people in Sikhottabong district, instruct local residents on measures to prevent diseases and accidental injuries, grow plants and raise cattle, as well as present gifts and build houses of gratitude to poor households. Hanoi’s Youth Union also granted office supplies to counterparts in Vientiane and Sikhottabong district. 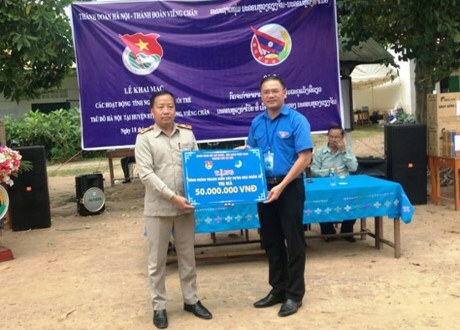 The total cost this year amounts to more than 700 million VND. Vice Secretary of the Hanoi Youth Union and head of the Vietnamese delegation Nguyen Ngoc Viet said the activities will help tighten solidarity and friendship between young people of the two countries.